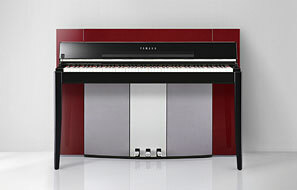 The instrument combines true piano sound in a modern, attractive cabinet that evokes the beauty of a real acoustic grand piano - adding sophistication and musical expressiveness to your living space. This new sound engine gives you the full playing response and expressive capability of a concert grand piano. In addition to providing smooth tonal changes that respond to your playing touch, it also features a Smooth Release function which clearly articulates staccato notes and produces the sound of lingering resonance when gently lifting your fingers from the keys - just like the soft damping action of real dampers. These effects capture the true essence of an acoustic grand piano to help you create and perform with authentic piano-like expression. The instrument’s keyboard has the luxurious feel of real ivory. The key surface is soft and slightly porous, giving the keys added grip and a natural friction that lets you play easily. 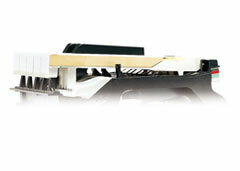 The special Natural Wood keyboard uses real-wood white keys just as an actual grand piano. Moreover, Linear Graded Hammer provides an authentic action in which the lower keys are heavy in touch and the higher keys are light, with all the natural gradations in between. All in all, this gives you the performance functions and expressive power found only on grand pianos, including having repeated plays of the same note perfectly articulated, even when playing at high speed or with partial key release. The Acoustic Optimizer is a new, unique Yamaha technology. Using a special design and position within the instrument, the Acoustic Optimizer physically adjusts the acoustical flow, which controls resonances and enriches the overall sound. The combination of Acoustic Optimizer and digital technologies provides an incredibly expressive capability. 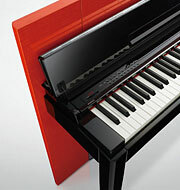 The instrument features 50 built-in piano preset songs, including both classic pieces and jazz standards. The preset songs are divided into scene categories, which correspond to a variety of favorite listening preferences and let you select your favorite songs according to the appropriate description. For even wider song selection, simply connect a USB flash memory device to the instrument - and your favorite songs in MIDI format are ready to be played in random or sequence. 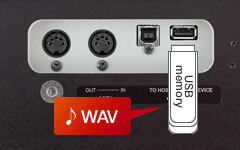 Audio files (.wav) saved to a USB flash memory can be played back on the instrument. Moreover, since you can save your performance as audio data to a USB flash memory device, it is possible to listen to your performance on portable music players, transferring the data by computer.